So far in this series, we’ve spent some time with the Simpson family for the holiday season, and we took a look at what Bart’s life is like inside the schoolhouse. This episode, “Homer’s Odyssey,” will be examining Homer at the workplace, or to be more specific; how Homer deals when that world is turned upside-down on his very head. I’m sure this episode will shock you with what we will discover; especially if you’ve seen episodes that come after this plot. This episode aired on January 21st, 1990 and was the third episode written and aired on television. The chalkboard gag for this episode is, “I will not skateboard in the halls,” a very basic and not-at-all surprising action to get in trouble for, but it is the first piece of evidence that we have in regards to Bart being a big skateboarder. The couch gag features the entire family sitting down on the couch with the couch falling apart at the very seams. These gags are still very basic in nature, but give it a bit as we are still in the first season. It won’t be until future seasons when they get more creative, whacky and start adapting references to other media. With that out of the way, let’s start talking about this episode. Even though this is a Homer storyline, the first act of the show focuses entirely on Bart. His class is going on a field trip to the Springfield Nuclear Power Plant, which just so happens to be the place where Homer works. We get some more insight to how much of a troublemaker Bart is at school, learning that he may have been the cause of letting some prisoners out during another field trip to the Springfield prison. His teacher, Mrs. Krabappel, is also very tired of his antics as well; not showing any sort of pity for Bart after he is forced to sit next to the kid that pukes on every bus ride, nor doubt when twins Sherri & Terri continue to play tricks on Bart throughout the trip. When they arrive at the plant and start taking the tour, Bart notices his father and calls out to him, causing Homer to look away from what he is doing and crash into a nearby piece of equipment. This accident angers his supervisor and Homer is fired from his job as result; turning this mini-Bart storyline into the main plot of the episode. After being fired, Homer looks for a new job but is constantly and consistently rejected at every interview. The rejection starts to affect Homer in a very negative way, turning him into an “unemployed whale” who does nothing but lay on the couch all day and not respond to anyone. After seeing a beer commercial, Homer is intrigued by the prospect of drinking his sorrows away, but when he checks the fridge, there is no beer in the house, forcing him into more extreme measures. He steals Bart’s piggy-bank and tries to take money from his own son, but when he realizes what he is doing AND finds out that not even his son has enough money, Homer feels like he is out of options and the next logical step is for him to commit suicide. Now, for those of you reading this and who have not seen this episode before…yes, that is a very dark decision to make, especially to such a sudden degree, but I kind of understand what the writers were going for and I’ll talk about this more in the review portion of this entry. Anyway, Homer grabs a boulder, ties a rope around it and carries it to the bridge above Springfield River. Thankfully, before too much time passes, the rest of the Simpson family find Homer’s suicide note and rush to the bridge to stop Homer from going through with his plan. Before he can do anything, Homer sees the rest of the family coming towards him while a giant vehicle is about to crash into his family, forcing Homer into action as he runs to his family (while the boulder is still attached to him by the way), and pushes them out of the way before it’s too late. This act of bravery inspires Homer to not kill himself and take action to make the town safer. 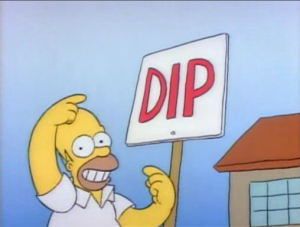 Homer becomes a crusader of public safety; petitioning the town to construct more road signs and warn people of the problems and dangers that exist around town. While the thrill of making the town safer gives his life new meaning, Homer realizes there is a bigger threat to the town and that threat is his old workplace, the nuclear power plant. Homer sets up a protest outside the building, forcing the owner of the plant, Mr. Burns, to take notice. After being impressed of the way Homer speaks to the crowd, Mr. Burns calls Homer up to his office to speak with him privately. Mr. Burns offers to give Homer a job at the plant again, this time being in charge of plant safety, on the one condition that he stops his crusade and tells all of the people outside that the power plant is safe and there is no more need to worry. Homer accepts the proposal at first, but when he tries to tell everyone that the plant is safe, he can’t do it because it would abandon his newfound principles. Mr. Burns is further impressed and gives Homer the job anyway, allowing Homer to take charge and make the plant safe himself instead of just sweeping the concern under the rug. Homer tells all of his supporters outside the good news, and the crowd cheers him on as he dances over his new promotion; leading him to falling off the balcony and being caught by everyone below him. Like most of Season 1, I first saw this episode when it released on the Season 1 DVD. Back then I thought the episode was fine and was a basic introduction to the power plant, but in recent watches, there were definitely some things that surprised me. For one, it surprised me how stretched out the story is and how it feels like three separate mini-episodes that are combined into one storyline. I also took notice that the episode introduced a lot of side characters and continuous gags and jokes that would be used in later episodes. And to top it all off, just the idea of the main character (or one of them) considering and nearly attempted suicide just really took me off guard, especially after watching future episodes and seeing how Homer would react to similar situations in a much different way. So in a lot of respects, this episode just seemed like a very interesting outlier to me; being iconic for some reasons and incredibly different and out of place for other reasons. I still have a few other things I want to talk about first, but I’m really anxious to start breaking this episode down in the review. This particular episode brought a few, notable, first-time jokes. For one, this was the first episode that featured the classic Bart Simpson “prank call” joke that would go down as being one of the most famous jokes of the series. Basically, Bart would call Moe’s Tavern under a fake name, and get Moe to say the name out loud, which usually would be some kind of crude remark or dirty saying. In this episode, Bart’s identity is known as “I. P. Freely.” This was also the first episode that mentioned the graffiti vandal known as “El Barto,” a mysterious figure that would go around town and spray paint “El Barto” on various walls and landmarks. There’s a lot of speculation on this particular joke, particularly the identity of El Barto, and because of the sketch artist’s interpretation, it’s very heavily assumed and implied that the identity is none other than Bart Simpson himself. There is a future episode that confirms this, but it isn’t until much later in the series, and with how many times the writers have backpedaled on revelations like this, it’s hard for me to be entirely convinced. However, the writers did state in numerous audio commentaries that this was always the intention and that they intended to include “El Barto” tags in every episode (or most episodes). In fact, the Kwik-E-Mart usually has an “El Barto” tag in most episodes the store appears in. This episode is also one of the episodes I think of when it comes to “freeze frame” jokes, especially with newspaper headlines. 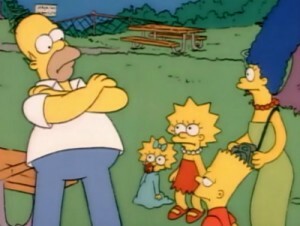 During the episode, when Homer is going around town and making the town safer, you see a variety of newspapers with funny pictures and captions of all of Homer’s deeds, and while they aren’t split-second like future instances of this, it’s definitely a big example of die-hard, classic Simpson fans going through these episodes and looking for all the little jokes sprinkled in during the story. It can be as simple as a newspaper headline or a bunch of humorous movie titles at the theater whenever the family goes to the movies, but one thing for sure, the Simpsons writers know how to make a good freeze-frame joke. This episode also continues the trend of Homer getting a new job after quitting or being fired from his position at the nuclear power plant, or him just taking an odd job in his spare time. This will happen numerous times over the series, and although his duty as a safety crusader didn’t pay anything, it was something he took seriously and seemed to be more proficient at than his actual job. In fact, I find this to be rather humorous that Homer seems to be happier and work better at every job he has, with exception to his actual job, which is the job he keeps for pretty much the entire series. I don’t have a lot to say about this episode when it comes to my favorite moments, but there are a few things that stand out to me. For one, I think it’s great that Homer is so passionate about his new calling of being a safety crusader for the town of Springfield. He may go a little overboard at times, but some of his suggestions were really good and he may have saved a few lives with some of the signs he got constructed. And then, when he realizes that the power plant is a big threat (because it logically is), he manages to fight the system with ease without any fear whatsoever. In fact, it’s his wife that actually has concern with him going against his old bosses while Homer is ready to fight tooth and nail to make the town safe. I think it truly shows, in a positive way, how much Homer can do if he just puts his mind to it. And for being a very dark part of the story, the one joke I always remember from this episode, which might be my favorite joke as a result, is the snarky remarks from the Winfields when Homer is carrying the boulder to the bridge to commit suicide. Mrs. Winfield remarks that “Simpson is going to kill himself,” while the husband remarks that Homer may not be attempting suicide, but rather “taking his boulder for a walk,” instead. Suicide jokes themselves are not funny and they never will be in any case whatsoever, but just the fact that Mr. Winfield was not quick to assume that, because of the type of person Homer Simpson is, just seems very funny to me; like in the sense that, “he really COULD be taking a boulder for a walk, you never know; he’s crazy Homer Simpson!” So that joke will always be a highlight for me, despite the dark tone of that particular moment. Aside from that, all of the other gags I mentioned and brought up earlier, from the prank phone call and the newspaper headlines, they’re also funny as well, but are more footstools for a series-wide joke than just a single, episode gag. I will also say that I do enjoy the montage of Homer having doors slam in his face when looking for a job, with the final door being at his home with Bart saying, “don’t give up dad!” before slamming the door shut. The last thing I want to call attention to, and this is probably the most shocking thing if you have watched episodes beyond this one, but in this episode, Waylon Smithers does not have the same skin color as he does in future episodes. This is the only episode where he is colored like this and the reason for it is because the animators were not sure what color he was supposed to be so they made his skin more brown/tan-colored. 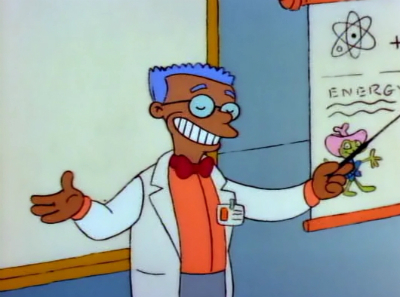 The writers of the show often joke that the reason Smithers was colored this way was because he had a very dark tan from an island get-away or something, so it’s good to know that they had their fun with this particular mistake. Other characters also have slight differences in the first season, namely Chief Wiggum and Moe have black hair instead of their trademark black and gray hair. Homer’s Odyssey is a very iconic episode, and I didn’t realize how iconic it was until I watched it back for this analysis. It introduces a lot of things we know about The Simpsons moving forward and it writes a lot of characters and jokes that we’ll see throughout the entire series. For that, this episode holds my respect for those particular introductions. However, as far as the story itself and the overall plot of the episode is concerned, I will say that this episode did fall short in a couple of areas, and is not one of my favorites as a result. As I mentioned above in the personal history section, this particular story is segmented. 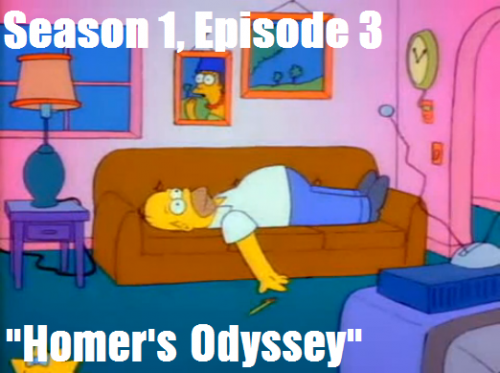 Act 1 focuses on Bart’s field trip, Act 2 focuses on Homer’s lay-off and depression, and Act 3 focuses on Homer’s safety crusade. I’m not saying there is anything wrong with jumping around to that degree, as I’m sure other episodes may do that format with success, but with this particular episode, it just kind of bothered me a little. I think it’s because there just aren’t a lot of jokes in this one because there is so much plot that needs to be set-up beforehand that the writers were trying to fill-in how to get Homer from point A to point B than writing joke after joke after joke. Whenever there were jokes, as good as they were, the jokes themselves seemed more like filler to compensate for a shorter run time than jokes that flowed nicely with the story. And sure, you probably don’t want to have too many jokes in your episode, but for this one, I feel like it could have used a bit more, at least in my opinion. There’s also quite a bit of confusion I have with the ending of this episode. During the ending, Homer is offered another job at the power plant under the condition that he tells his supporters that the plant is safe. Homer tries to, but is unable to go along with it because of his principles. As a result, Mr. Burns compliments him and gives him the job anyway, which prompts Homer to go outside and tell everybody that he is going to be the safety inspector. This confuses me, because what exactly changed between the two times Homer went out to the balcony? Nothing really. 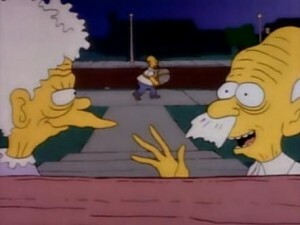 So why couldn’t Homer just say his speech the first time he went out there? I feel like for this moment, you really have to examine the syntax of what the two were talking about. 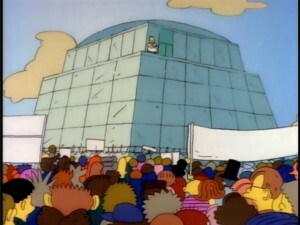 And as far as my interpretation goes; the first time Homer went out, he was just supposed to say the plant was safe with no context, in Mr. Burn’s interest of sending everyone away and stopping the protest. However, the second time he goes out, he says that he will taking the job and trying to make the plant safe on the inside, which is much different than the original intent of sweeping the problem under the rug. However, if Homer said that speech the first time, would Mr. Burns not give him the job? I mean, either way, it was a win-win. I think it makes sense from looking at it from the perspective I mentioned, but truth be told, that did have me confused for the longest time and I think it could have been written a little better. And surely I can’t overlook the giant boulder in the room when it comes to the “attempted suicide” scene. I’m not going to speak ill of this moment, because again, I get what the writers were going for, and truth be told, I think they handled it very well. Homer was depressed, he couldn’t provide for his family, he had no skills to work with or any alcohol to help him cope with the pain; so he felt like he was only getting in the way of his family, and therefore felt useless and not important at all, which is why he made that decision. I can’t imagine how that must feel for someone or anyone going through those types of thoughts, which is why it was refreshing to see Homer discover his life’s purpose at the end of that scene, but I think it was good for the writers to spread that kind of awareness and the message that suicide is not the answer. And considering the extreme nature of this topic, it’s just really interesting to see them deliver that message so early in the series and they did it with only a two minute scene, as opposed to an entire episode. It’s also interesting, especially when looking at how Homer would cope with a problem like this in future episodes, just seeing how sudden and how out of left field this scene came from. These days, Homer would come up with a kooky scheme or crazy project to get his mind off and away from the power plant, but this time, it really hit him hard and in a way that most people probably wouldn’t see coming from him. I guess that goes to show you how much this show has changed over the years, and on a more serious note, how serious and scary depression can be in general, and how it should never be overlooked or ignored. This episode took me a bit longer to make because I was trying a slightly new format with these posts, but at the end of me finishing my rough draft, I realized there was way more information and writing than I really even wanted, so I spent an entire day re-editing and modifying this document to get it in the format I wanted before I realized that I was more happy with the usual format I’ve been doing for these posts. I guess it’s just a case of, “if it’s not broke, don’t fix it.” But seriously, as usual, any insight or advice is helpful, so don’t be afraid to tweet at me or send me a message if you have some thoughts. Thanks everybody! See you next week for the next episode!